Do you need to set up for an extended stay or just need space for a lot of people? This guide will give you the info you need to find the best 10 person tent. I have spent a lot of time in tents including living in one for about 4 months in my rambling 20s. You begin to pick up the little details that make a good tent when you depend on it. The whole goal of a shelter is to keep the weather on the outside and you on the inside. If it can do that, you have a head start on something worthwhile. But we can’t just depend on that, a good tent also has to be durable and a few comfort features never hurt. Let’s get an idea of what to look for! Not every tent that advertises a 10 person capacity will sleep 10 people unless you are really friendly with each other. Luckily, most of us have no need to sleep that many. A large tent can just be room to spread out a little. If you do have 10 people, you really need to pay attention to size. It might be a good idea to check out some of the diagrams that show sleeping arrangements. At a minimum, you want around 150 square feet of floor space with 200 being optimal. Of course, that’s only two dimensions. Height is important to consider unless you want to walk hunched over or crawl everywhere. This is best based on the height of the tallest person you plan on having in the tent. Add a few inches for comfort’s sake. A second part of a comfortable height deals with the slope of the tent. No tent has a flat roof, they are either a dome or an A-frame. If you sleep mostly on the sides of the tent, they can be a little shorter but you should consider how you will set up and move around the tent. With any piece of gear that you will have out in the elements, durability is a big issue. If you plan on using it for shelter, it needs to be water resistant. In colder climates or in cooler seasons you probably want something that is windproof to some degree. Most tents are constructed of polyester taffeta and nylon mesh. The thickness of these materials will dictate how durable and wind resistant the tent is. So will any seam sealing or treatments that may be applied. Though thickness and durability will add more weight, you don’t buy a 10 person tent with the intent of packing it around. Always opt for better materials and deal with the weight however you can. You will be thankful if you have to deal with foul weather in your portable home. You may also want to check out the material any of the supports are made out of. Steel is really the best choice for most tents. It is heavy but is much more durable and flexible than aluminum and costs much less than carbon fiber. We should probably talk about weight. As I said, you aren’t going to be packing these tents very far but weight is always a concern for camping gear. Light is good if you can get it but you need to moderate what you think light is when dealing with a large tent. Some 10 person tents may weigh as little as 30 pounds but get reach 60 or more pounds for the larger tents. Usually, you will be camping with these from your car so you won’t have to carry them very far. That’s good because hauling a 60-pound duffle bag up a hill is a feat even for the fittest people. Use your better judgment when it comes to weight. Generally, heavier will be more durable if a heavy tent doesn’t bother you. Airflow is important in warmer months but can make things a little chilly in cooler weather. You always want some airflow in your tent but choosing how much you really need can be tricky. Enough to keep you cool and air out any camping funk but not enough for you to freeze to death is quite a balancing act. Many tents have windows that can be zipped open or closed to help with ventilation. This is the best all-around option. Tents that have no windows should be reserved for cooler weather while tents with permanently open windows are best in dry, warm weather. Consider how you plan to use your tent and the climate and weather you are likely to experience. At a minimum, you want some ventilation and at least the ability to keep out the rain. It seems counter-intuitive to have an outdoor space in a tent you bought to get into the outdoors but they are very nice to have. When it rains, it can be quite a challenge to spend your time in a polyester bag with no real view of the outdoors. It’s just claustrophobic and uncomfortable for most people. Having a mesh porch can get you out in the open even in the rain. They work wonders at warding off mosquitoes. Great for those times you aren’t ready for bed but don’t want to be a bug’s midnight snack. They are also great for increasing ventilation by closing the porch but leaving the tent door open. They are a preference. They add quite a bit of weight and often a decent bit of cost but that can be worthwhile on extended stays in the outdoors. The most common additional feature on larger tents is a room divider or even two for some tents. This affords you a little privacy if you have a large number of people. If you just want space, this also separates the clutter of all your camping gear from your sleeping area. Some tents may have a power cord access port to run electricity into your tent. If you camp where there is power, these are handy and beat running the cord through your door. Most people will never use one but they are nice if you have the option of power. Gear Storage is a great thing to have. Most tents have pockets or even a gear loft to keep things organized. Having a cluttered tent can ruin your feeling of relaxation. You can keep things stored in packs and totes but for easy access to important gear, some sort of storage is a good thing! Now that we have an idea of what we are looking for, let’s take a look at some of the most popular and notable tents on the market. For what I would consider one of the best cabin tents on the market, The Alpha Camp is a surprising value. It has just about every feature you could ask for in a tent and more room than most people would ever need. If you truly do have 10 people, this is absolutely the tent you want. With almost 240 square feet for floor space and a ridge that is over six and a half feet high, this tent is massive. To help keep it aired out it has 5 windows that sit under the eaves and a large door that can be left open making it airy and cool in warm weather. Made of a high-grade polyester with fully sealed seams throughout, this tent is fully waterproof and quite durable. Especially with all steel poles and nylon mesh netting. Even the screen room has a floor to keep water and bugs out. The overall weight of 32 pounds is surprisingly light for such a large tent but no more surprising than the 3’x1’x1’ package this tent packs down to. 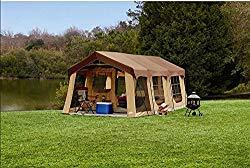 If you are after a 10 person tent with a screened porch, this is one of the best on the market. It may not be as cheap as some options but you are going to get a lot for your money. I love a tent that doesn’t look like a tent. I love one even more that has so much space that it could almost be a house. With 200 square feet of floor space, this amazing cabin tent with a porch is the perfect option for outdoor recreating. If the huge floor space isn’t enough, this tent is over 7 feet tall in the center and nearly 5 at the edges. Even the tallest person should have plenty of headroom for walking around. Add in the room divider for some privacy if needed or use all the space for your whole family and then some. Material wise, this tent is made of the standard poly taffeta but with an Everdry coating. The seams are all sealed. The floor seams are double sealed for zero moisture intrusion. The large windows provide plenty of airflow but can be zipped shut when the weather dictates. To further your comfort, the entire top of this tent is mesh and covered with a full coverage rain fly. This is the maximum of ventilation with the minimum chance getting wet. Even the porch has an attachable floor for use on those rainy evenings. Easy to set up and easy to take down, this is an amazingly spacious tent that was designed with luxury outdoor recreation in mind. Everything is maximized, well except the price. In the dollar per square foot game, this tent wins every time. If you have never been in a Core tent, you should check one out. They are among the more popular tents, especially for people on a bit of a budget. With amazing construction and features that were obviously well thought out, it’s hard to find much wrong. This is on the smaller side of 10 person tents at just 140 square feet. What makes this tent work is the very straight walls, high roof, and abundant gear storage. These features make it possible to use much more of the floor space for living and less for keeping your stuff. With multiple pockets and a gear loft, much of your equipment says out from underfoot. Other thoughtful features are the removable room divider and electric access port. It even has specific hooks for holding lantern or other light sources. The H20Block treated poly keeps rain out and the multiple windows and mesh roof provide plenty of air flow. Sealed seams prevent any moisture intrusion, even in driving rain. The oversized rainfly does a great job with coverage without impeding air movement. This is as close to an instant up tent as I have seen in a cabin style. Setup takes just a few minutes and takes down just as easy. Even the storage bag is well thought out, it expands to make fitting your tent back in a snap. This is an amazingly spacious tent with plenty of height and packs down to a very modest 10-inch tube that is less than 30 inches long. The final weight is about 15 pounds all included. If you can get by with a little less floor space, I think this is a tent worth every penny. Coleman has been making tents forever and have become a staple in the industry. This is mostly thanks to their value for quality ratio. They are known to be durable, comfortable, and well designed. As we move more into conventional tent designs, it seems proper that Coleman should lead the way. This 160 square foot tent has two separate areas that max out around 80 inches in the center and slope to each side. This is a decent amount of space for most any use but could be tight with 10 adults. When it comes to materials, Coleman had it figured out a long time ago. With full 75D poly taffeta and welded seams, you get a rugged tent that keeps out even the worst rain. All materials are treated with a PU coating to protect against UV light and improve water shedding making this one of the best tents for bad weather. With two large eave windows and a fully ventilated roof, you can get plenty of airflow and still keep out the worst rain. This is improved by the well-fitted rainfly and sealed door zippers. Speaking of doors, it has two, one for each room for added privacy on those rainy evenings. Of all the tents we have explored this is probably the easiest to setup and with a little practice can be done in as little as 15 minutes. The steel and fiberglass poles slide together easily and make overall setup a breeze. Weighing just 31 pounds, it may still be heavy but is among the lighter tents of this size. Its well-constructed and well thought out. The Weathermaster does the job exactly how a Coleman should. As we move into what I would consider the best budget 10 person tent, it’s important not to compromise too much on what makes a decent tent. You always give up a little when you go budget but you should never give up so much it’s a waste of money. Many things about this tent I would describe as modest, like the 180 square foot of floor space and 6-foot roof height. But that’s fine for a budget tent. At least you aren’t giving up something important like durability to get the price down. Speaking of durability, the polyester fabric of this tent feels thicker and quite durable even if they don’t advertise what it is. The main reason I feel this tent is more durable is that it weighs nearly 10 pounds more than I would expect for a tent this size. And that is with fiberglass poles. The Olympia is a full three-season tent that is quite waterproof which is appropriate since its named after a rainforest. The seams are sealed and it has a high weld on the bottom to keep water from sitting on the lower seams. The rainfly is perfectly sized with a front awning to keep rain off the door and door zippers. Going up is easy with a standard pin and ring system and should take about 20 minutes tops with a little practice. There is a power access port and plenty of gear storage which works out well with the more modest floor space. If your situation makes carrying a 45-pound tent a possibility and you want to save a little cash, this a good tent. Much better than you get out of those big box store brands. It may not be perfect but for a few camping seasons it should hold up very well, even in the worst weather. Tents of this size are more of a rarity with most people focusing on smaller and lighter gear. The companies that are making these have had to put a lot of focus into the quality and features of the larger tents to sell them. This is always good news for the consumer. Considering that the price of a 10 person tent isn’t that daunting, especially for the space you get, you may want to get one if you ever expect a large group. Give these tents a good once over, I am sure they can provide some insight into what makes a decent home away from home. Even if you don’t choose one of the above tents, at least you will have a solid idea of what’s available for what price.